This is a bundle product of my Number Practice 1-10 and my Teen Number Practice products. 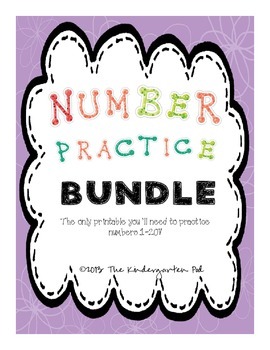 This bundle is truly all you need to practice numbers 1 through 20! Each page provides the opportunity to practice reading the number, writing the number, writing the number word and exploring that number. The numbers 1-10 focus on coloring a given number of objects, drawing a given number of objects and distinguishing that number from others. Number practice pages 11-20 also focuses on reading & writing the number but introduces ten frames and tally marks for additional skill practice. 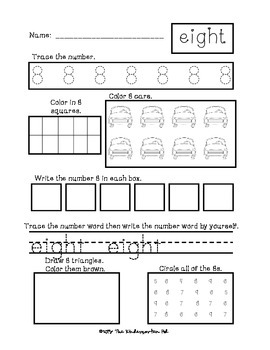 This activity is Common Core Aligned and can be used as whole class introduction, independent center work or even homework. Best of all, there is NO PREP involved in this product. Just print and you are ready to use! If you have any questions about this product, please don't hesitate to contact me at thekindergartenpod@yahoo.com. Thanks!